The chess pieces above is the most tall chess in the world. Those are also designed in slim add its tall looks. They are the King, the Queen and two Bishops. You can complete it with the other chess pieces set like the Rook, the Knight and the Pawns. The tall chess pieces has polished in black with glossy looks. But if you want have it in other colors, you can order it to us. 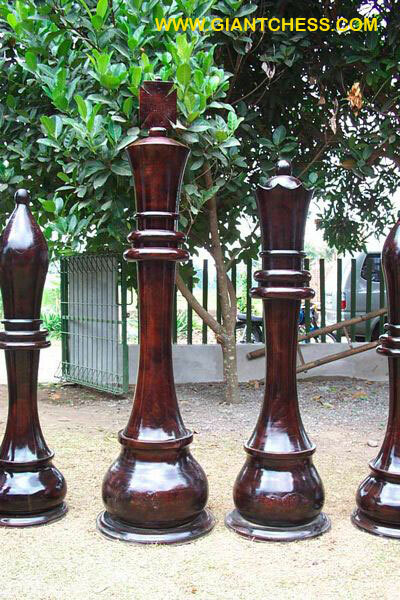 Those tall chess pieces are handmade product, made by professional craftsman with their expert skill in carved wooden product. Perfect for your garden decoration or hotel decoration. You may left it outdoors for months without worry about it durability. This kind of garden decoration is very durable because made of Teak wood, which is famous as the strongest wood in the world. Get it now!